I am delighted to have been a part of Multicultural Book Day since its inception. This year, I received two wonderful books from the publisher and author. If you enjoy reading these reviews, please consider following my blog by clicking on the word Follow or by hitting the orange RSS Feed Button in the upper right-hanc corner of this post. 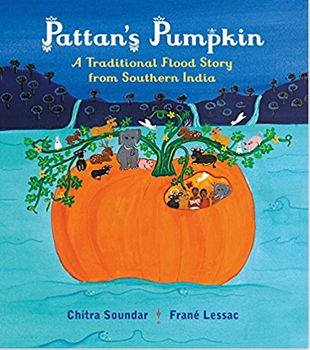 I am delighted to share a Southern Indian flood tale story for 2017 Multicultural Book Day. Pattan and his wife, Kanni, lived on their farm alongside the Sahyadri Mountains. They tended goats, bulls, and elephants. Their crops included peppers, rice, nutmeg, and bananas, which they generously shared. One day Pattan discovered a sickly plant so he decided to care for it next to his hut. Due to his tender care, the plant miraculously grew into an enormous pumpkin. When a terrifying rainstorm did not abate, the couple decided they must flee with every living thing that lived on their farm. Where could they hide? Pattan made the decision to harvest the pumpkin. All the animals pitched in to hollow out the pumpkin as Kanni filled sacks with food supplies. When they were finished, the animals dove into the pumpkin as Pattan cut the stem holding it in place. Kanni sang a lullaby to soothe the young animals as the storm thrashed outside. Eventually, the rains let up, and the pumpkin came to a halt. Pattan peeked out and discovered that the sun had appeared. They began their journey home. Pattan had kept one seed from the pumpkin savior. Ever since that day Pattan and his descendants look after their animals and pumpkin crop in the Kerala valley. This hardcover book is richly illustrated in primitive folk style. The colors are brilliant and rich. I would recommend the book for young readers in preschool and the primary grades who will appreciate the narrative that unfolds through the pictures. Suggested as a bedtime story or read aloud. Shelly, her brothers, Matt and Ben, and her friends Audrey and Maya, are having fun attending a softball game in which Shelly’s cousin, Olivia is playing. As the game continues Shelly decides that she would like to learn how to play. Shelly eagerly accepts Olivia’s invitation to play catch with other teammates after the game. 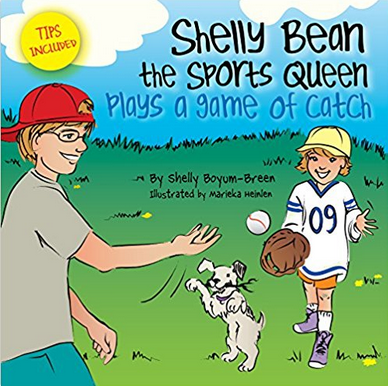 At first, Shelly throws and catches underhand, but Olivia urges her to progress to overhand throws. Soon Olivia can do both. Olivia arrives home and proudly adds another “jewel” to her paper sports crown. Olivia sets realistic goals for herself and rewards herself for achieving them. At the end of the tale, the author includes tips on how to throw and catch a softball with a mitt. She also provides a glossary of basic baseball terminology. The book teaches readers the values of determination and good sportsmanship. It encourages girls to pursue competition in sports. Colorful and simple pictures with large print text allow primary grade readers to follow along easily. Recommended for girls who want to become players as well as princesses.